A pouch that forms in the wall of the large intestine is called a diverticulum. When it becomes infected or inflamed it is called diverticulitis. It is not clear why the pouches form. Doctors believe a constant pressure is built up when food moves too slowly through the bowel. This pressure increases then pushes along the side walls creating pouches. Digested food or stool can become trapped in one of the pouches. This leads to inflammation and infection. Symptoms can come on suddenly. They vary depending on the degree of the infection. The doctor will ask about your symptoms and medical history. A physical and rectal exam will be done. Finding the disease early is important. The pouch can break, releasing stool into the abdomen. This is a surgical medical emergency. Antibiotics and other drugs are given to fight the infection. Pain medications and drugs are given to decrease the abdominal pain. For mild inflammation, you can drink clear liquids for the first two to three days. For a more severe case, you will be admitted to the hospital, where fluids are given intravenously (IV). Antibiotics will be given to you through IV. If you have nausea and vomiting, a plastic tube may be inserted through your nose into your stomach. This will help with the vomiting and make you feel more comfortable. Changes in your diet can help prevent future attacks. When surgery is done on an emergency basis, the surgeon will remove the diseased bowel. Because of the serious infection, the two ends of the bowel will not be hooked together. 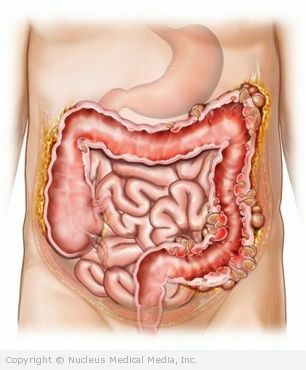 You will most likely end up with a piece of bowel coming out to your abdomen ( colostomy). After a period of 6-12 weeks, the surgeon will go back and hook the bowel back together. If you are diagnosed with diverticulitis, follow your doctor’s instructions.